Hello Friends! Welcome to my new Blog: StampinFool.com! As many of you know, I have waited YEARS for this domain to become available and it has finally my new home. A few things to keep you in the loop. If you subscribe to stampinfool.wordpress.com, you will need to resubscribe here. To Subscribe & receive the posts by email each day: At the right hand top of the page it says Subscribe to Blog. Enter your email address into that box. You will receive an Email that says “Follow Stampin’ Fool“. Click “Confirm Follow“. It may take you to a webpage confirming, but you needn’t worry about that. You will now receive my blog posts. All of my previous posts, photos and cards are here now, so if you are looking for something specific, use the search tool in the right upper hand of this blog and it will search all of my posts for your keyword. They layout may change, but don’t worry, it’s still me; I am trying out new looks. Lastly, CELEBRATE!! Because I am so happy to finally have a permanent Stampin’ Fool home! On to the next order of business. I’m redecorating. This is not craft related, but I am quite happy to share all about it. 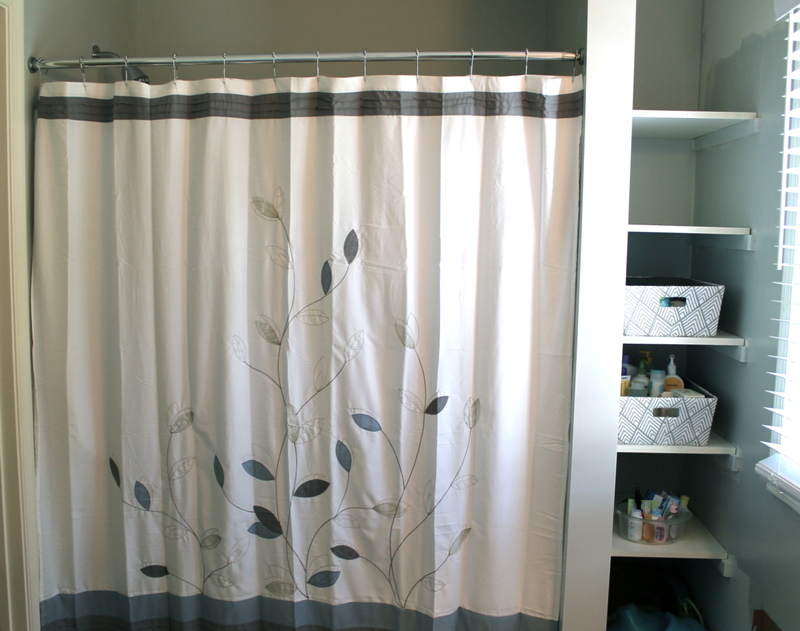 My guest bathroom was in severe need up an update. It was plain. Plain white. and more white. After all, time is limited with a two year old. 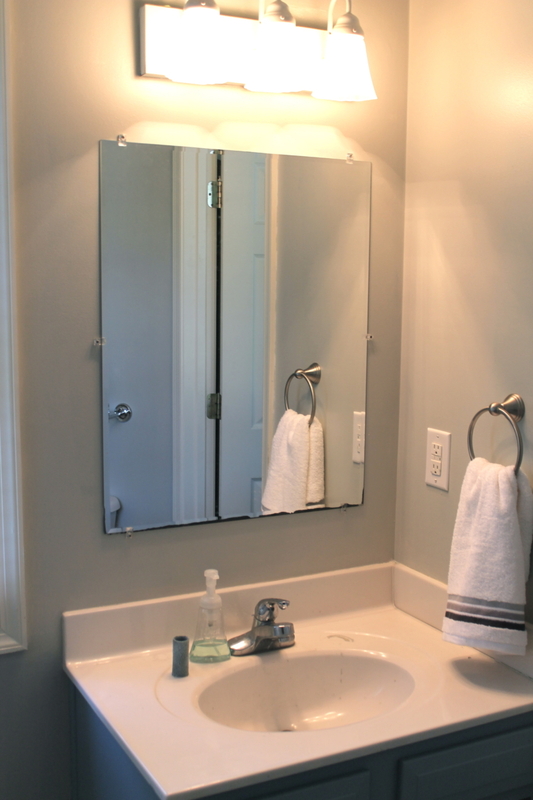 Sunday afternoon I decided to crash the bathroom with a can of paint and a few accessories. I headed to Lowes for paint, a shelf, new door handles and a towel holder. Here’s the update. It’s not finished, but it’s getting pretty close. 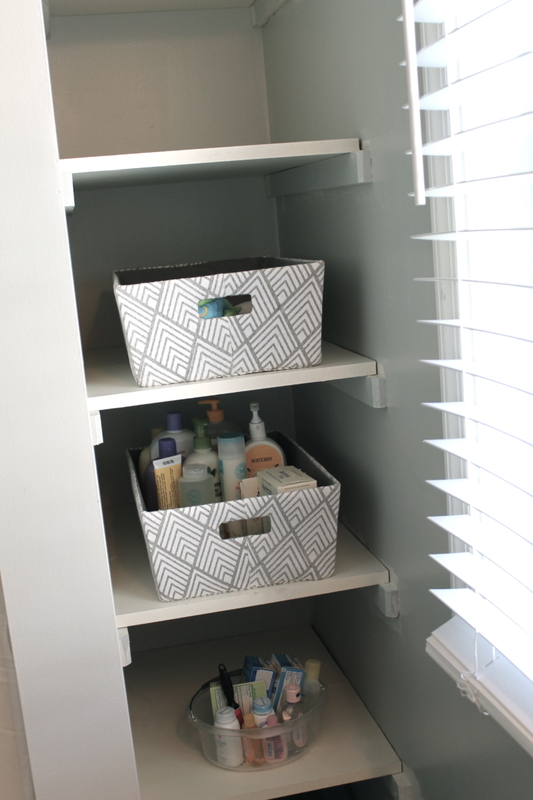 I adore these new baskets from TJMaxx to hold toiletries. The top ones has rolled towels for Silas and the bottom two have lotion, soaps, baby oil, powder etc. I plan on putting two more under the sink to hold that stuff as well. 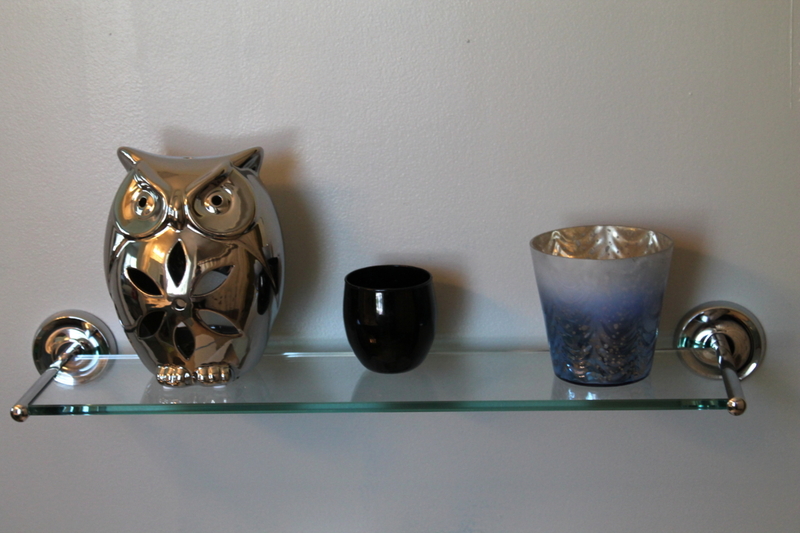 The glass shelf came from Lowes and the owl and blue candle holder from TJMaxx. The walls are a light Gray, called Notre Dame, from Valspar at Lowes. I also used this color in our bonus room on the end accent wall. Now here’s the sad section it still needs a new mirror, vanity light and the doors (which are currently drying) need to be affixed to the cabinets. 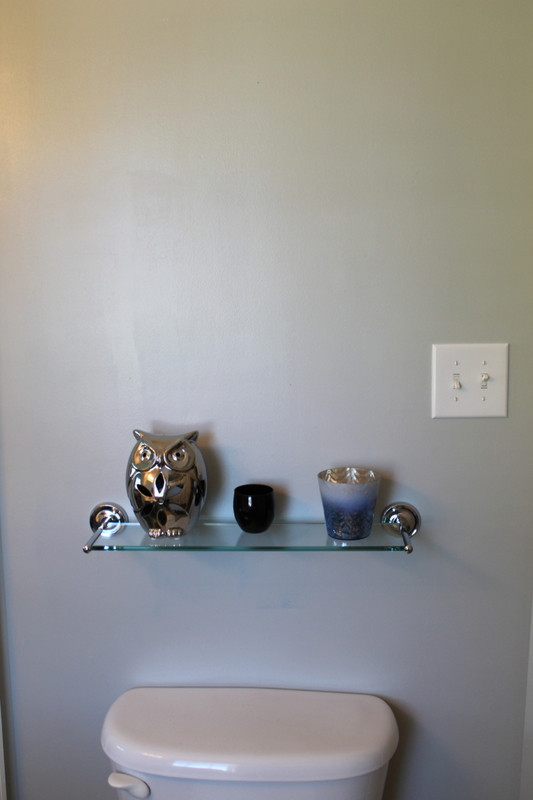 I painted them a smoky blue color and added new Allen + Roth handles from Lowes. I grabbed the towel holder and a new fowl from TJMaxx as well. The counter is bare- excepts for the paint splatter which I have to scrub off so I will be decorating that area soon. More photos to come after it is all complete, but for now, happy DIY! And I promise to post card and stamp tutorials soon.